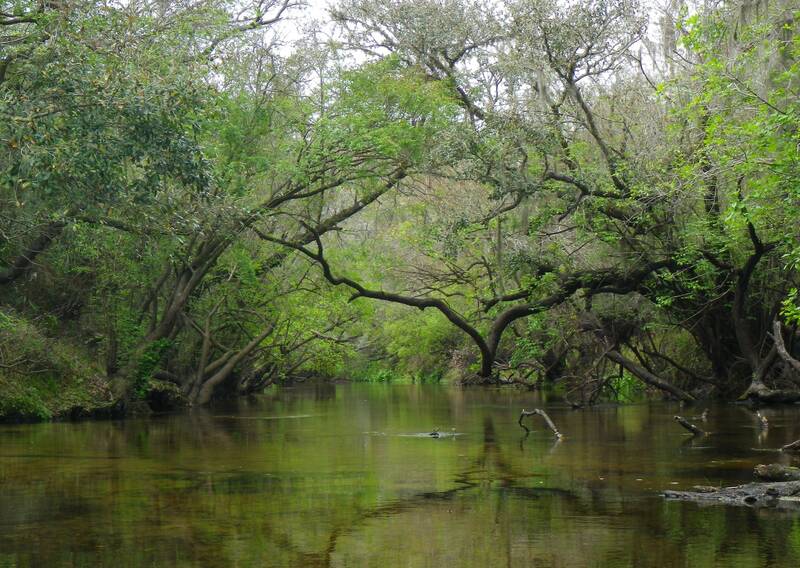 Rather than paddle from the Outpost to the Little Manatee River State Recreation Area, I chose to paddle the upper river, the 9-mile stretch between CR 579 and the Outpost. Here, the river is narrow, canopied, less traveled, and wild. This time of year, the water level is low, and as I gathered my supplies, the folks at the Outpost warned me to expect a portage or two. I began my paddle west, sheltered by steep banks and wooded forest. I could see the fish scurrying beneath me and could have easily touched the river’s sandy bottom with my hand—the water was that low. A great blue heron flew up the river toward me, its wing span magnificent—what a sight. About an hour into my paddle, alone on the river and lulled by the sweet harmony of the birds in the woods, I suddenly became alert when the bushes on both sides of the river came to life. Wild hogs, first one large black one to my left, then more to my right, and for the next 10 minutes or so I paddled through the land of swine with hogs racing up the banks as I approached. I spied a couple wild turkeys as they quickly bobbled away, as well. The poachers had apparently been successful, as I saw only one small alligator. However, the turtles appeared quite large and healthy! I spotted ducks, herons, hawks, cardinals, and even a few red-bellied woodpeckers. The low waters had created high steep banks in some places and low sandy beaches in others. I scooted over sandbars and logs and under overhanging branches trying to avoid all the obstacles. My mantra became, “I ain’t ‘fraid of no bugs” as I checked my hair and body each time I emerged from the branches. (I read that during the rainy season, this water rises rapidly, and with all the obstructions in the water, one must be quick to make it through without mishap!) Grapefruits, oranges and tangerines added a splash of unexpected color against the green and brown backdrop of oaks, willows, pines and cabbage palms. For nearly four hours, I paddled past undeveloped landscape—with few reminders of civilization except the Florida Power plant just about halfway and the abandoned railroad trestle further along. Oh, and then, of course, there was the small group of four-wheeling, beer-drinking rednecks who greeted me just past the trestle. Other than that, it was a fabulous, peaceful day on the river.